The war in Georgia will divert attention from the Anthrax false-flag attack revelations. They want to close the case without anything but circumstantial suspicions, because they know it was an inside job, a false-flag operation conducted by the U.S. government to pin on Iraq. The new war will cause more heads to spin. What's it all about? It's about Empire. It's about oil pipelines. The Baku-Tbilisi-Ceyhan pipeline (BTC pipeline) doesn't cross Russia. (Follow the money.) British Petroleum is the largest shareholder and operates the pipeline. It's about land, resources, and population control. It's about neocons and false-Zionists in Israel and the U.S. working to undermine Russia. According to widely circulated reports that have not been denied, the Israelis have been training and advising the Georgian military (and in Haaretz), as have Americans. These nuts are trying to start WWIII. What a mess the plutocrats cause on purpose. The messier things get, the more difficult it is for people to sort it out, so the ultra-rich just have their paid PR people devise stories to sell the people on handing over more power and control to the other underlings of the plutocrats so the plutocrats may bask more and more in their own decadent glory. The U.S. has been trying to pry away as much support for Russia in the area as possible. 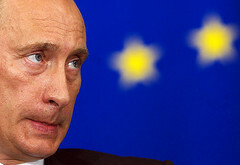 It has done a terrible job vis-Ã -vis Russia ever since the fall of the Berlin Wall. The dumbest thing was not coming to the economic aid of the Russians right away. George H. W. Bush just sat on his hands. Then when the U.S. did help, it gave the Russians the worst economic advice possible. As a consequence, the oligarchs tried to buy up Russia. From there, Putin came to power and has been tightening up ever since. It's been a direct reaction to laissez-fair capitalism and ever-increasing fascistic tendencies exhibited by the neocon George W. Bush administration. It's just lies on both sides. The Russians and Americans both did false-flag operations on their own soil to convince their people to make war for Empire. It's bad all the way around. George H. W. Bush didn't help the Russians when the timing was perfect for starting a real partnership that would have benefited the entire planet. He rather did nothing so the capitalist/socialist plutocrats could make more money in a completely short-sighted, selfish way as always. Georgia isn't going to beat Russia. Of course, Russia isn't going to want this to ruin all of its business deals. This isn't the Soviet Union and Georgia isn't Chechnya. The U.S. and others in NATO, along with Israel, are analyzing every move Russia makes to gauge Russian military capabilities. Russian knows this of course. They aren't tipping their full hand. The Russians know they are up against a small but highly trained and modernly equipped nation in Georgia. Reportedly, Georgia has about $2 billion in military equipment from the West with more to come if fighting continues. If you dig deeper, you will also realize that this is a ploy by neocons to further weaken the United Nations (not that the U.N. is the best system). The neocons want the League of Democracies to replace the U.N. They want only those nations that side with the U.S. and Israel to be considered for membership. Of course, the U.S. and Israel have extremely tarnished so-called democratic credentials now. Just look at what has been exposed about Israeli political Zionists and extremist Talmudists in their actions and attitudes toward the Palestinian Arabs and Christians. Also look at what the neocons have done to eviscerate human and civil rights around the world and in the U.S. on a completely domestic basis. They are the enemies of humankind. They must turn, repent, and atone or burn with the tares. This is the way of it. It's just the truth. It's just a warning that comes out from compassion and no threatening spirit.